This week’s blog is going to focus on building the German order of battle for our action around Maleme, Crete. 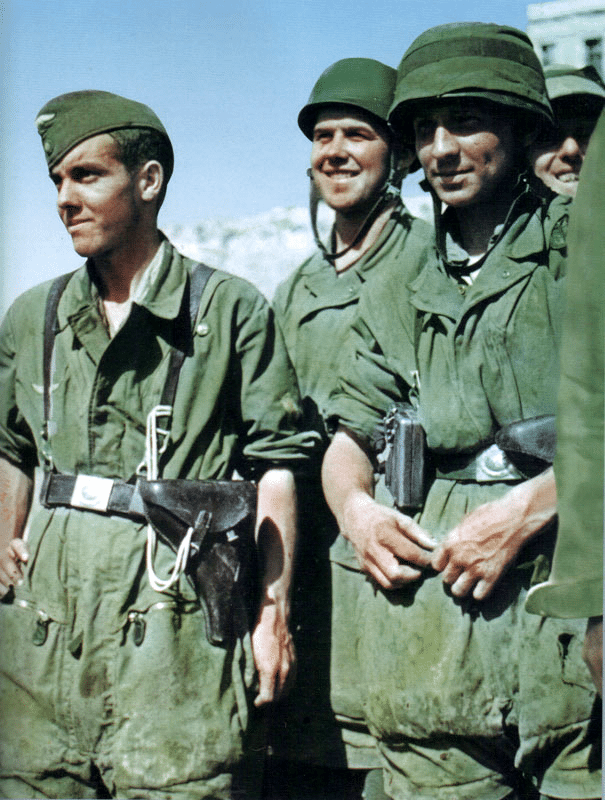 The primary unit that led the initial assault at Maleme was the Luftlande-Sturm-Regiment 1 (in English the 1st Air Landing Assault Regiment). The Sturm Regiment had been expanded from the single battalion that famously captured the Eben-Emael fortress in Belgium by glider assault in May 1940 – to an over-strength four battalion regiment a year later. The basic formation used in the Sturm Regiment was the company (approximately 150 men). 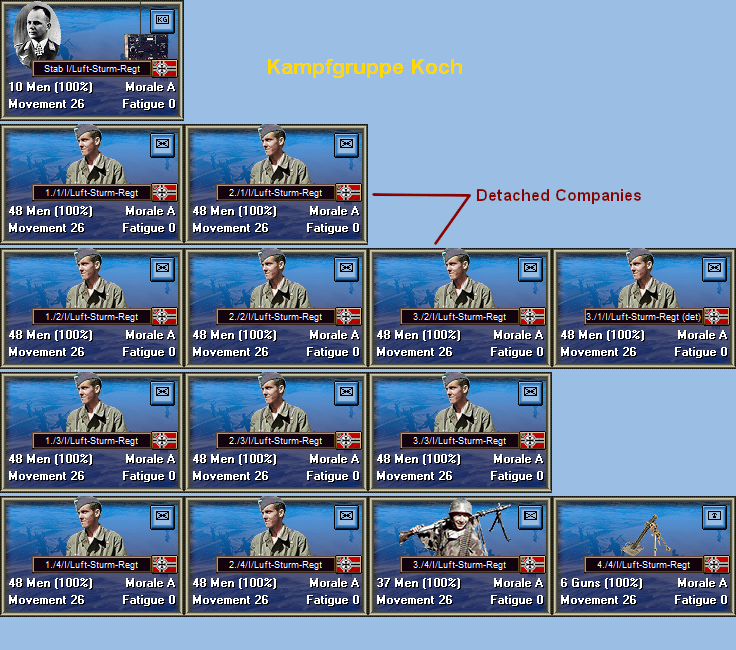 Individual missions or objectives were usually tasked at a company level and where larger forces were required, multiple companies were grouped into Kampfgruppe (War Group – a flexible command formation) or as a complete battalion (four companies with approximately 640 men). 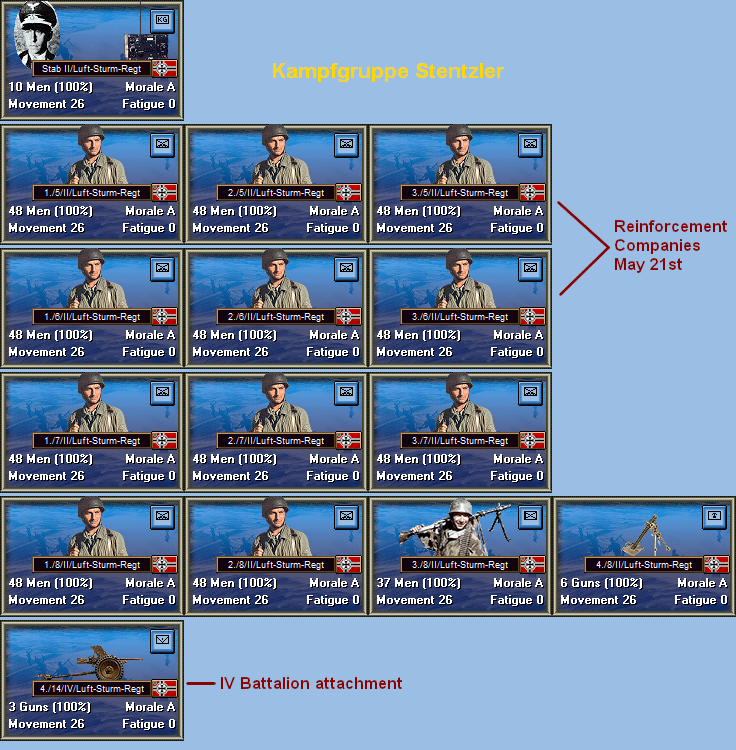 When laying out a Panzer Battle’s order of battle we have to build these formations up from a platoon level (with usually three or four making up a company). Finding platoon level detail is harder than it sounds but fortunately the Germans utilised Kriegsstärkenachweisungen (KStN or War Strength List) to document the approved strength of a unit. Each parachute company was comprised of three of these platoons and headquarter group (or Stab). Each battalion included three parachute companies, a headquarters group and a heavy weapons company. A couple of things to take note of; Firstly, the I battalion is made up of glider companies rather than parachute companies. Secondly, each of the heavy weapon companies in the parachute battalions are identical with six heavy machine guns and six 81mm mortars. Thirdly, the IV battalion in the regiment is a support battalion with artillery, anti-tank, anti-air and engineer companies. With this blueprint we were able to build our first pass of the order of the battle. 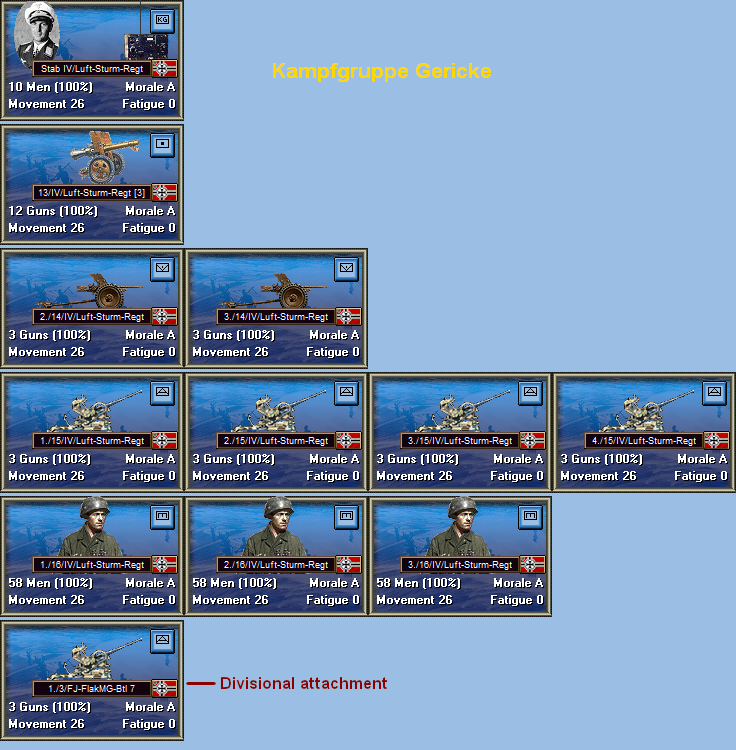 The layout of units represented the approved table of organisation of each unit. This was the recommended layout, but not necessarily the actual strength or structure that went into battle on May 20th, 1941. This is where the research as discussed in last week’s blog comes in. Various texts also mentioned Hauptmann Braun’s assault on the Tavronitis Bridge. Braun had created two glider platoons and a parachute platoon from the regimental staff and support troops. 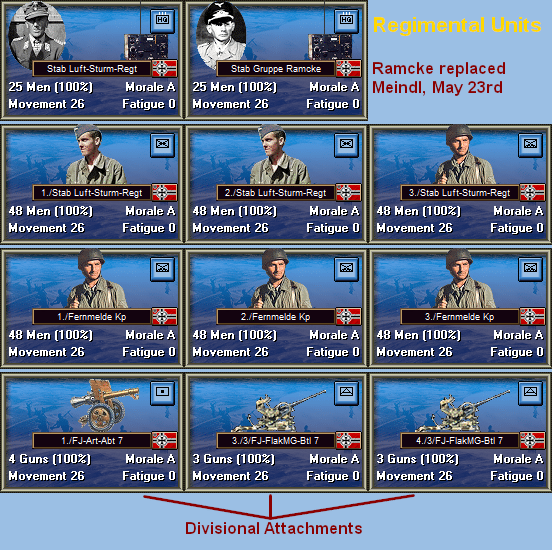 Normally these troops would not be represented in game but in this case they were used offensively; both glider platoons assaulted the bridge and the parachute platoon arriving with the regimental commander, Meindl. It’s not surprising that with an airborne operation, that all troops were expected to fight on landing. With no rear area it was necessary to prepare all forces for action. Also of interest, these additional forces at Maleme were required to offset the detached 1st and 2nd glider companies that were given separate missions to take out anti-aircraft sites near Canea. Both these companies were tailored to their individual missions with the 3rd platoon of the 1st company attached to the 2nd company (see below). They were not expected to re-join their parent battalion during the first day and the regimental troops were required to take their place. Finally, elements of the IV battalion were attached to a number of the heavy weapons companies of the parachute battalions. Much of their equipment (3.7 cm Pak 36 & 2.0 cm Flak 38 and motorcycles to move them) was destroyed when landing in olive groves and the rougher than expected ground. Only one battery of 7.5cm LG 40 recoilless rifles arrived by glider – the rest of the heavy equipment was parachuted in with significant losses. With the IV battalion essentially broken up, it never fought as a complete entity. 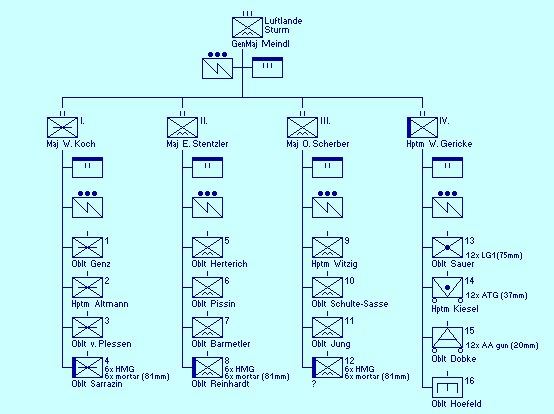 The only included infantry was Oberleutenant Hoefeld’s 16th engineer company and that was used to clear Kandanos, well south of the airfield with the aim to stop any allied reinforcements. This is a simple example of the review and cross referencing that goes into an order of battle. Mike Avanzini does much of the research for our order of battles and has significant reference resources to use. Mike plans to write a series of blog posts that covers off the many nuances between the various combatant nation’s order of battles. Next blog post we plan to cover the British and Commonwealth order of battle for our Maleme action. 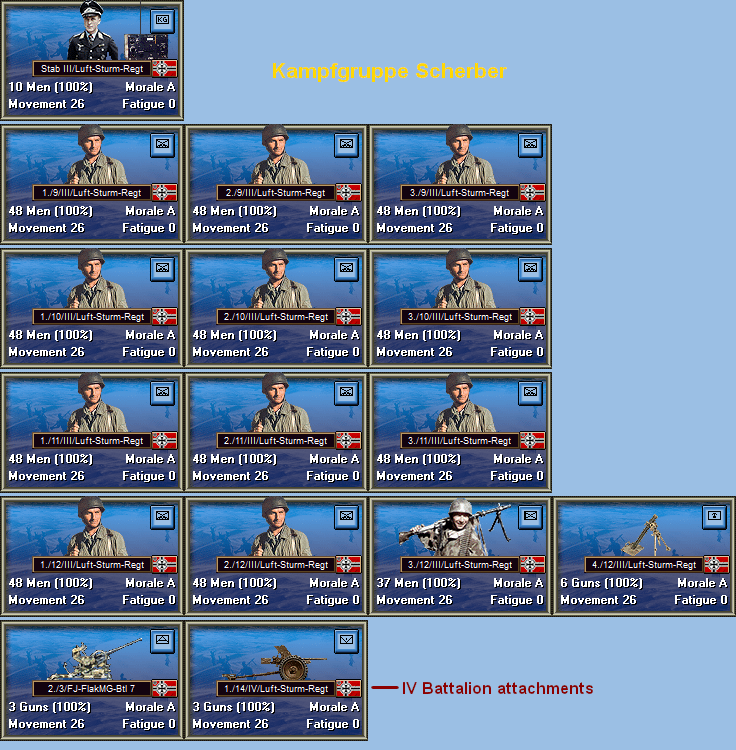 ← So you want to design a Wargame? Great photo at the top there. Will subscribe to this blog, if I can. Yeah, it’s a great photo! We have simplified subscribing to the blog. Just use the subscription dialogue at the top of this page (right hand side). But it’s a scenario for Demo game or for a New title? Thanks and good job! All will be revealed when ready…!